NASA has unveiled a stunning image of Jupiter's moon Io rising off the gas giant's horizon, captured by the Juno spacecraft. Slightly larger than Earth's moon, Io is the most volcanically active world in the solar system. At the time, Juno was about 18,400 kilometers from the planet's cloud tops, at approximately 32 degrees south latitude. Citizen scientists Gerald Eichstadt and Justin Cowart created the image using data from the spacecraft's JunoCam imager. 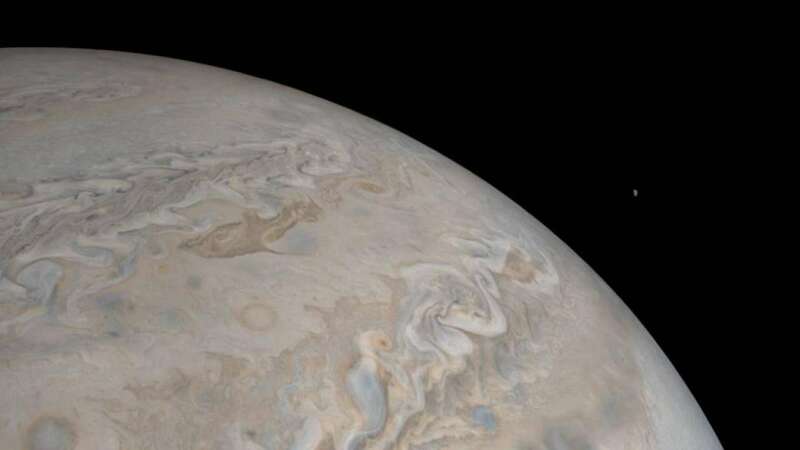 JunoCam's raw images are available online for the public to peruse and process into images. Juno's principal goal is to understand the origin and evolution of Jupiter. Underneath its dense cloud cover, Jupiter safeguards secrets to the fundamental processes and conditions that governed our solar system during its formation. As the solar sysmtem's primary example of a giant planet, Jupiter can also provide critical knowledge for understanding the planetary systems being discovered around other stars. With its suite of science instruments, Juno will investigate the existence of a solid planetary core, map Jupiter's intense magnetic field, measure the amount of water and ammonia in the deep atmosphere, and observe the planet's auroras.